Rules – The Dark Poetry Scholarship. Authority – the Dark Poetry Scholarship is established by the authority of the Horror Writers Association Board. Anyone with an interest in writing horror/dark fantasy poetry may apply. Membership in HWA is not a requirement. The application period shall be determined each year by the Scholarship Committee. The Board will appoint a sub-committee of no less than three members, who will be the sole determinants of the winners of each Scholarship. The sub-Committee will be composed of one Board member and two previous winners of the Bram Stoker Award® for Superior Achievement in a Poetry Collection (unless otherwise authorised by a resolution of the Board). The sub-committee has the discretion not to announce a winner if it feels no applicant is up to the required standard. The sub-committee may not allocate joint winners of any Scholarship. They may not give multiple Scholarships to the same person in one year. They may not give a Scholarship to a writer who has previously won any HWA Scholarship. Applicants must fill in and submit the Application Form designed for that purpose; the Application Form must be published at www.horror.org but may be also made available in any other way the HWA sees fit. Membership fees in non-genre writers’ groups or associations to a maximum of $100 per year (and only where such membership can be demonstrated to assist in the winner’s writing education). The Scholarship will be made available annually but the HWA Board has the right to suspend the Scholarship in any given year for the sole reason of limited finances; or to abolish the Scholarship altogether. Notice of such suspension or abolition must be given no later than 31 October each year. Your Essay indicating your intent in applying for the Scholarship and how it will benefit your professional writing career. An Education Plan. This Plan should indicate how you would propose to spend the US$1,250 scholarship should you win. A list of no more than three references (none of whom may be members of the HWA Board). State why each reference has been chosen and provide an email address for each. 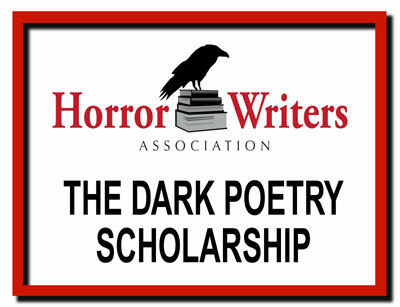 The Dark Poetry Scholarship was originally made possible by a grant from Michael Randolph. It is currently funded by monies received by HWA from the Authors Coalition.